I’ve had over 17,000 mornings during my lifetime, but I doubt I’ve ever awoken as cautiously as I did in the Hótel Egilsen on 9th November 2014. We had occupied a room at the top of the hotel and, lying in bed, I could reach up and touch the slanting ceiling above me; a ceiling that would painfully remind me of its presence should I sit up too abruptly during the night. That morning, after a cursory feel of my head for hotel room-inflicted bumps, and finding none, I slid in a less-than-dignified way to the end of the bed and prepared to head down to breakfast. The breakfast was excellent and substantial – and our host proudly repeated the locally-sourced nature of most of the offering. By the end of the meal, he also seemed to have forgiven me for my earlier, embarrassing faux pas of perusing the breakfast buffet selection prior to taking my seat. However, judging from the deeply affronted look he gave me at the time, I doubt he’ll ever truly forget the incident. Suitably fortified, we ventured outside to take a few photos of Stykkishólmur before hitting the road again. Our plan for the day was to head anti-clockwise around the Snæfellsnes peninsula, before considering a target destination for the night. We soon discovered that yesterday’s clear blue sky had come at a cost. The absence of cloud cover had allowed what little heat there was to disappear into the night, chased away by a bone-chilling cold. Although we had experienced significantly colder temperatures during our winters in Moscow, I can only surmise that the purity of the Icelandic version of cold, ably assisted by Arctic winds, increases its intensity. 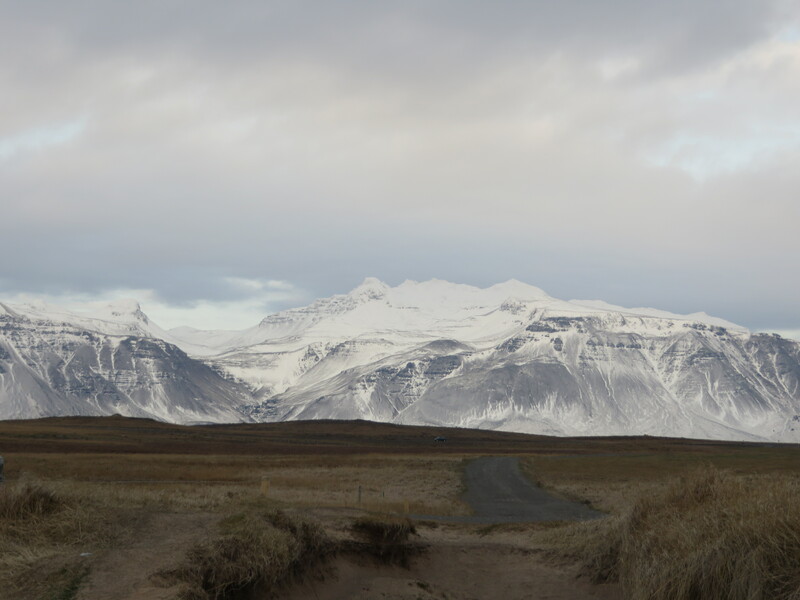 Approximately 15 kilometres from Stykkishólmur, we decided to take our first off-road excursion of the trip. Taking route 558, a track well within the capabilities of a standard two-wheel drive car, we headed through the massive Berserkjahraun (lava field) – and drove straight into the middle of an Icelandic saga. According to the Eyrbyggja Saga, in the 13th century, the daughter of a local farmer was the object of the affections of a Berserker (notoriously violent and savage warriors, the preferred choice of bodyguard for Viking nobility, and where we get the expression “gone berserk”). 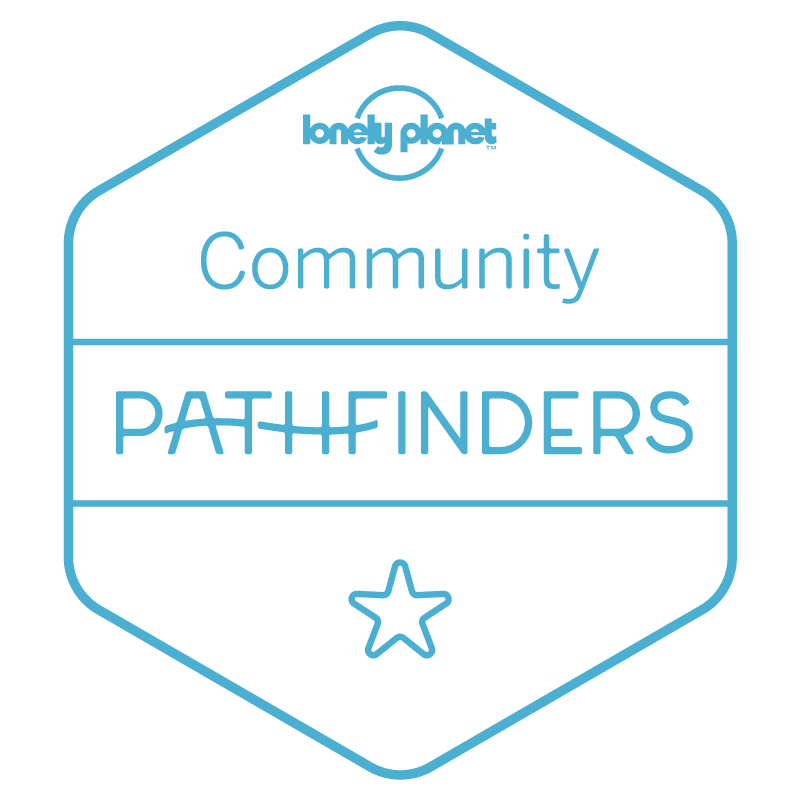 In an attempt to put the matter to rest, the farmer set the Berserker the seemingly impossible task of carving a path through the lava field. Should the Berserker succeed, he would be allowed to marry the farmer’s daughter. Working with a fellow warrior, and to the dismay of the farmer, the two Berserkers were able to complete the task. Unfortunately, the reward for their efforts was to be trapped in a sauna and murdered by the farmer which, I think it is safe to say, was not exactly the hot and steamy ending the Berserker had in mind. Witnessing the scene today, the Berserker could have been excused for simply resting on his tools and marveling at the rugged beauty of his surroundings. There would be other women. 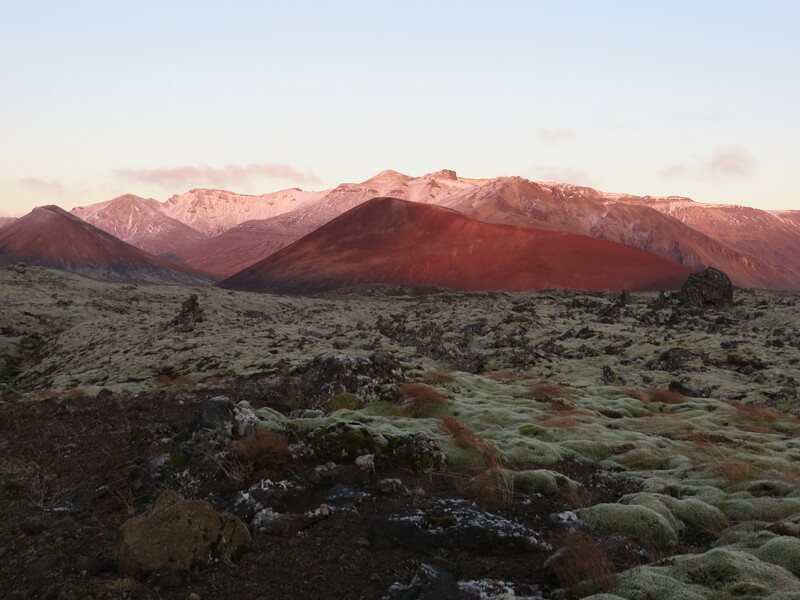 As we passed through the lava field shaded by the Snæfellsnes mountain range, the late morning sun was playing delightfully with the landscape. Our eyes flitted erratically from side to side as we tried to absorb the wonder and variety of the scene; stopping at fifty metre intervals as yet another amazing view appeared. It felt as if we were driving through another world. 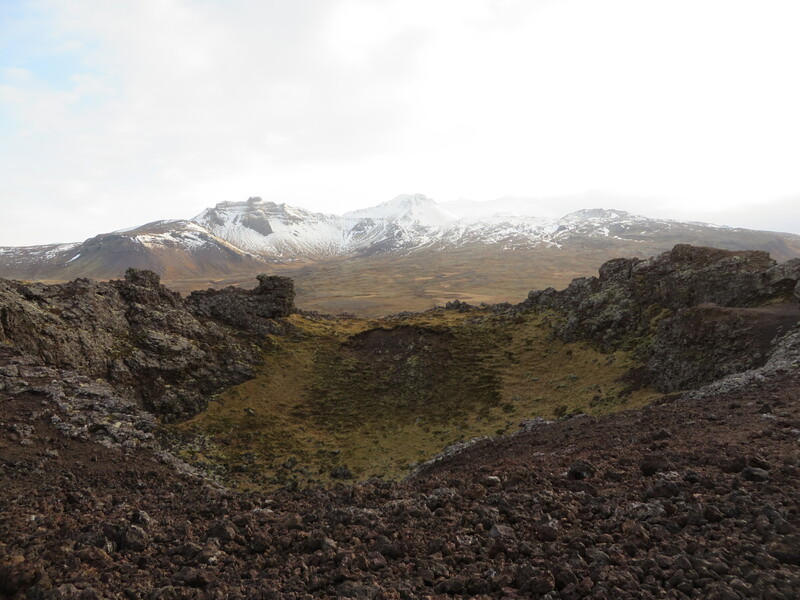 It took us at least an hour to travel less than ten kilometres through the lava field. 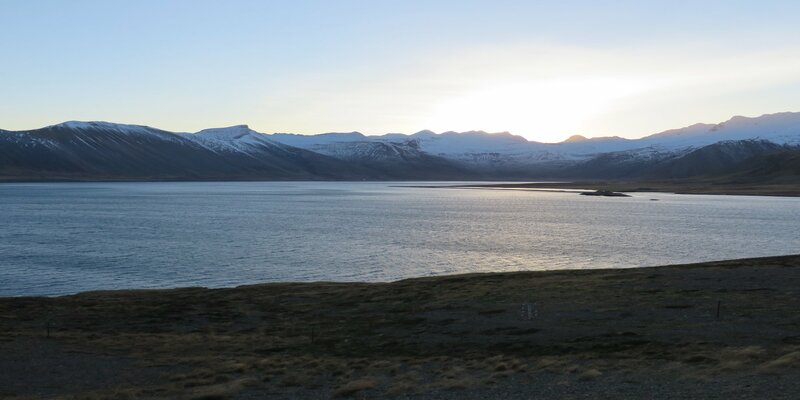 We eventually turned back onto the main road, sped deliberately past the local farm specializing in the local delicacy of hákarl (rotting shark meat), and continued on to Grundarfjörður. Watching over the town is the stunning Kirkjufell. I doubt there is a travel book about Iceland that doesn’t include a photograph of this iconic site, or a tourist who has ever managed to drive past it without whipping out their camera – and I wasn’t about to be the first. Continuing westward in the constant shadow of the immense Snæfellsjökull ice cap, we ventured off-road again to visit Skarðsvik, an incongruous golden sand beach many degrees north of where you would expect to find it. The relative shelter afforded by the lava tongues on the beach provides a stark contrast to the clear blue waters of the ocean that pound against it. Our resolve to continue beyond Skarðsvik to the western tip of the peninsula was quickly shaken – in a literal sense – by the bone-jarring ride delivered by the track, which deteriorates unapologetically beyond the beach. 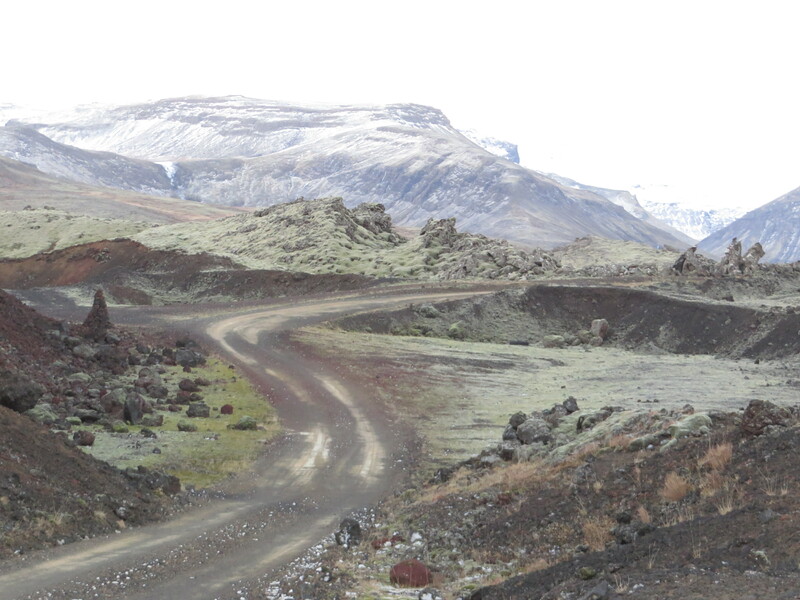 Giving up and retracing our path, we returned to the main road and, in a few kilometres, breezed past Saxhóll – a small volcanic scoria crater. An advantage of being one of the only cars on the road in Iceland is, should you breeze past anything, you often can simply stop your car and reverse back to the missed turning. Without anyone witnessing the maneuver, two hundred metres later we were heading toward the parking area at the foot of the crater. In search of our exercise for the day, we proceeded to climb to the top of Saxhóll. The iron “steps” on the path do more to hinder than help the ascent, but at least they are on the side of the crater shielding the climber from the incessant, battering wind. Upon reaching the summit, sitting down for the obligatory photo opportunity is more a necessity than an attempt at artistic composition; for standing up exposes you to a wind that would surely lift you out to sea. In any event, the panoramic view from the top more than repays the moderate exertion. Continuing south, we stopped at the beach at Djúpalónssandur and encountered a strength test to supplement our recent cardiovascular exertions. Here, four “lifting stones” of various weights can be found toward the rear of the beach. In days past, these stones were used to test the strength of aspiring fishermen. On this day, they were able to prove – if further proof were needed – that I’m no fisherman. Djúpalónssandur is a dramatic and desolate place, accentuated by the scattered and rusting remnants of the English trawler Epine, which wrecked in the nearby waters in 1948. As the road turned back toward the east, our minds turned to our stomachs. Consulting the map, we thought nearby Hellnar would likely provide a couple of alternatives for lunch but, instead, the town had that freshly-abandoned eeriness most often found in science-fiction movies; I wouldn’t have been surprised to see someone stumbling frantically between the buildings, shouting out random names. After a short stop in Ytri-Tunga, where we tried and failed to see the barking seals that reputedly grace the area, the lunch quest reached a successful conclusion in a roadside café in Vegamótum. 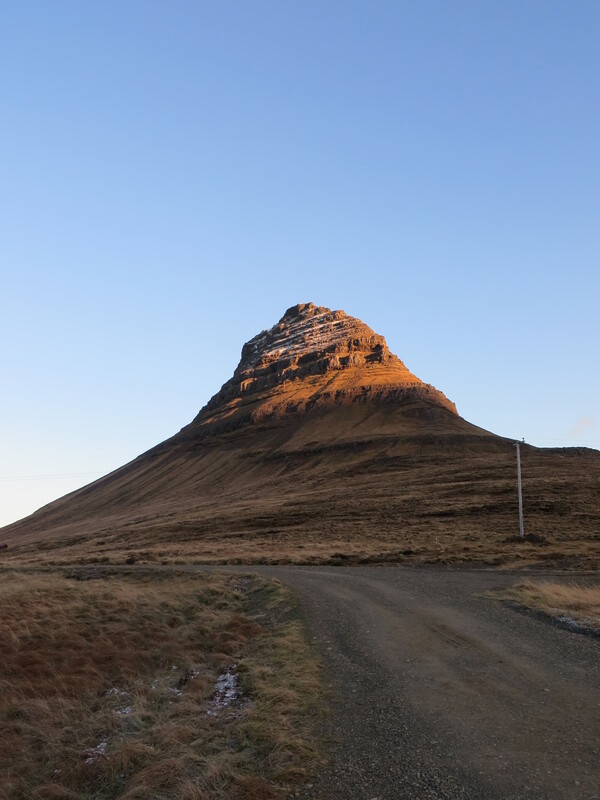 Located at the road junction where, yesterday, we had turned north toward Stykkishólmur, today’s daylight revealed the mountain range over which, with blissful ignorance, we had so confidently passed. 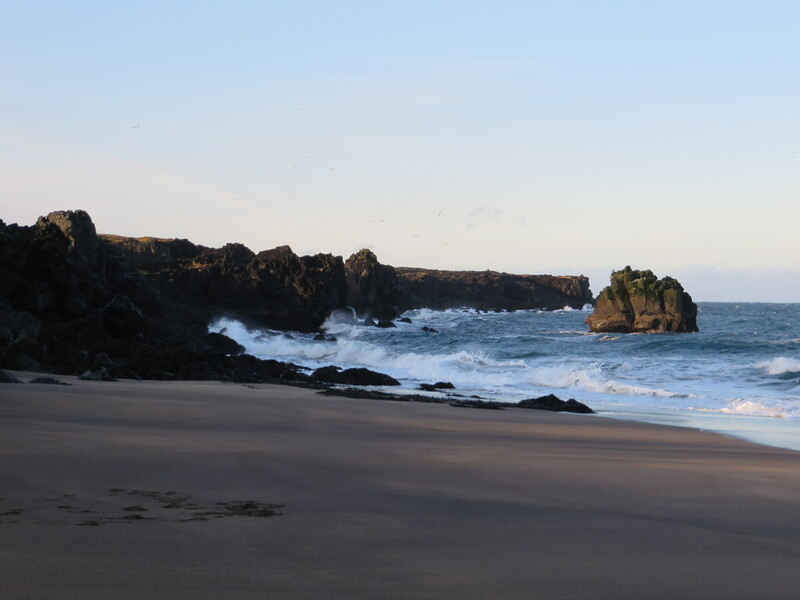 During lunch, we decided to spend the night on the Reykjanes peninsula, to the south west of Reykjavík. This would allow us to spend some of the evening “taking the waters” at the Blue Lagoon. The decision came with its fair share of trepidation. The Blue Lagoon is one of Iceland’s most famous tourist attractions and, even at this time of year, we expected queues of people would bring an abrupt end to our three days of almost uninterrupted isolation. With the exception of an adrenalin-pumping near miss with an overtaking car coming in the other direction, the journey south was uneventful and we arrived at the Northern Lights Inn around 6pm. Thirty minutes later we were standing in front of the reception desk at the Blue Lagoon. As a general rule, I will religiously avoid the tourist trap, but even I have to admit that the Blue Lagoon is well worth the visit. Fed by the water from the nearby geothermal plant – which looms over the site and would surely make an ideal basecamp for any aspiring James Bond villain – the milky-blue bath water and the resulting clouds of steam combine to deliver a scene that is just weird enough to take your mind off of any crowd. If, like us, you happen to be there in the dark when the temperature has dropped below freezing, what was merely weird starts to transcend surreal. The wind creates white-caps on the water as it whistles across the lagoon; the cold freezes the moisture on your face while your body is submerged in water that varies from pleasantly warm to piping hot. Add in the disconcerting, instant numbness you feel when your toes inadvertently breach the surface of the water and the occasional ghostly, silica-painted, beer-carrying patron floating past, you find that the, “do we have to?” question you asked before arriving is soon answered with, “I’m glad we did”. Snapped out of our relaxed mood by the exorbitant café prices, we returned to the hotel and put our name on the list for a northern lights wake up call. We were not disturbed. In the morning, we would head back toward Reykjavík for the final part of what we already knew would not be our last Icelandic adventure. We visited (and blogged) about Iceland a few years ago and still think it’s the most visually stunning place we’ve ever been. Loved seeing your photos and remembering just how wonderful it was. I’m glad you liked the article and the photos. As you say, it is visually stunning – to the point where you feel the need to stand and applaud the scenery. We can’t wait to return. Wonderful post and images. Snæfellsnes was one of my favorite areas. 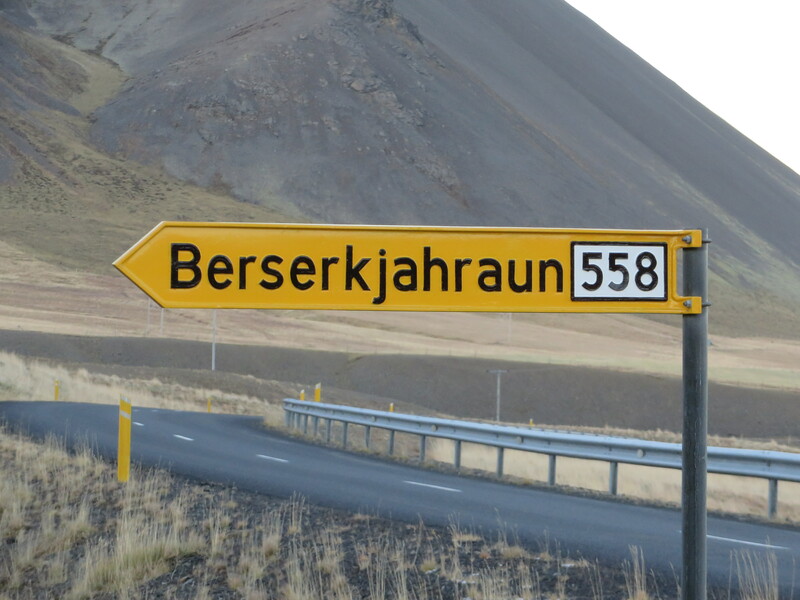 Love the red mountains in your Berserkjahraun image. I only saw the peak of one of these mountains as we drove along the dirt glacier road. Thanks Denise. We were in the Berserkjahraun in the late morning and the sun was just managing to struggle over the Snæfellsnes mountains. It added a wonderful light to an already awe-inspiring scene. We felt taunted by the beauty!